Would you like to learn some brand new killer effects that you can perform anytime, anyplace and without any props? Then you're in luck. 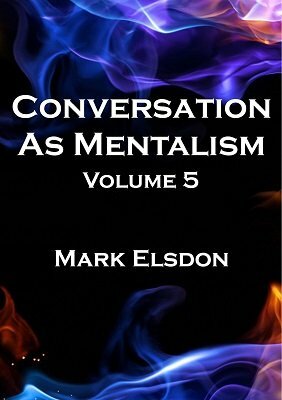 Mark Elsdon's new Conversation As Mentalism Volume 5 is just what you're looking for. In The Stars - A recording that impossibly predicts EVERY choice a participant will make! ACDC - The performer correctly identifies the exact date on a random coin that he never touches. Three Objects One Brain - Three participants choose and hide three random objects whilst the performer's back is turned. Nevertheless, he immediately knows everything! No Weigh! - Under increasingly impossible conditions the performer is able to tell the 'weight' of a word. Dreamachine - An incredible number revelation from the devious mind of Andrew Brown. Oodles of Doodles - A simple yet powerful impromptu psychometry demonstration. BPW - A random book, a random page, a random word. A not-at-all random revelation. Nine brand new effects that have been designed with one outcome in mind - to amaze whoever you are talking to without the aid of any gadgets, gizmos or gimmicks. Conversation As Mentalism 5 once again teaches pure, propless mentalism at its most organic. 1st edition 2017, 22 pages.